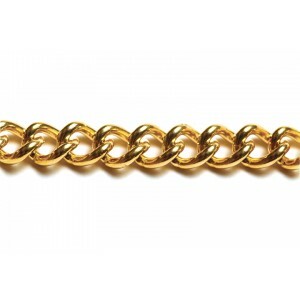 We stock a variety of loose Brass chain which is cut to your requirements. We are hoping that you will find a suitable design for your fashion jewellery. Brass Oval Trace Chain 2.5mm x 3.3mm, wire 0.6mm + E Coat. 1 meter approx. 7.7gr. E-coating – al..
Brass Round Trace Chain 3mm + E Coat. 1 meter approx. 10.6gr. E-coating – also known as Electrop..
Brass Round Wire Oval Chain 3mm x 4.5mm, wire 0.45mm + E Coat. 1 meter approx. 5.5gr. E-coating ..